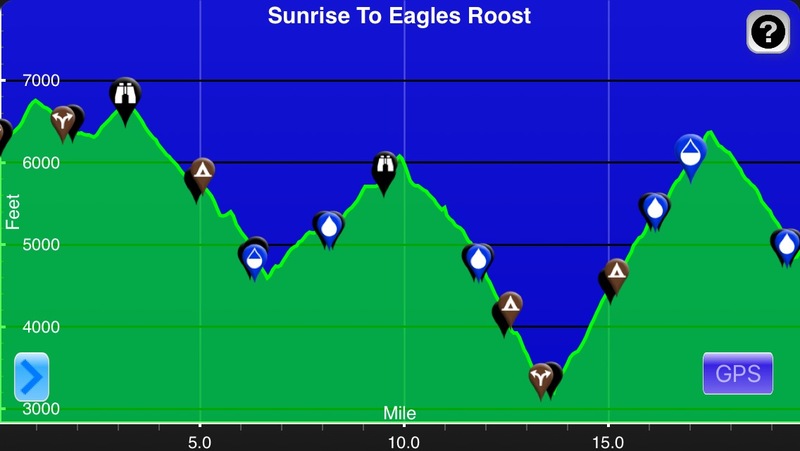 Elevation chart courtesy of the Wonderland Trail app from Guthook Hikes and Tami Asars. Today may have been the one day that we had significantly less elevation gain than loss. We did 19.7mi with 5,823ft of uphill and 7,184ft of downhill. Of all our days, today was the most enjoyable on many levels. I think that if we weren’t on a permit, we would have naturally walked this distance and pace, so that was nice to have a day that felt natural. We got a leisurely start at 7:40am. It turns out we camped near a blog follower that I was keeping an eye out for and I didn’t notice it until just as we were leaving this morning. It was fun to make that connection. It would have been a bummer to figure that out a week from now that we had camped at the same place had we not seen one another. A shout out to Tina and I hope your group’s hike went well! Man, I just love the Northwest. Early morning low lying clouds. This will be another picture heavy entry. 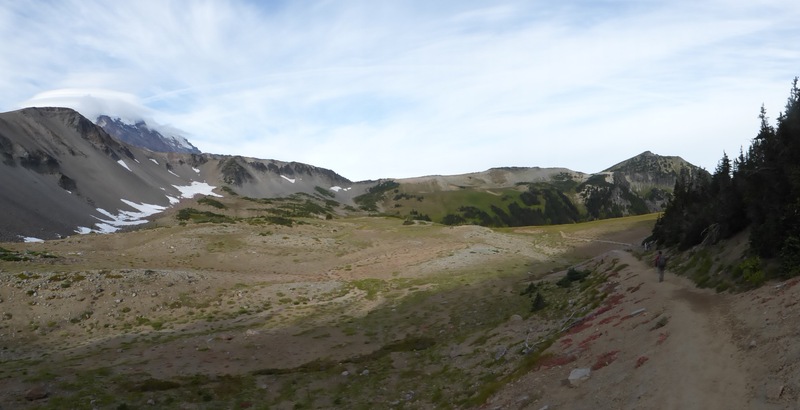 For anyone wanting to do a section of this hike, the trail is more above tree line on the east and north sides. I’d say it’s still more forested than not, but there are definitely more open views on those sides. For me, this is a bit of a farewell for a while to this kind of scenery as I’ll be leaving in a couple of weeks to hike for 5-6 months in Australia and New Zealand. I do love the Pacific Northwest and today gave me a wonderful sendoff. Buck-30 commented, and I agree, that we really couldn’t have gotten more perfect weather it seems. I heart the clouds up here and we had some great whispy ones all day while Rainier had a little cap of clouds on and off. Coming around to Skyscraper Pass was one of the most stunning and sudden views of the whole loop. That is Winthrop Glacier. That is pure ice under that moraine. Yes, there was plenty of wooded hiking as well today. A nice relaxing lunch at Mystic Lake with Old Desolate behind it. We came across a lot of backpackers today, 51 people (17 women, 34 men). After lunch, we came across a couple that we saw our first day. This also happened yesterday with another guy we had seen our first day. If you are going opposite directions of others doing it in a different amount of days there is a chance you’ll see each other twice. That was fun. The couple we saw today had a good story. They did this loop 20yrs ago and got married at the Sunrise camping area, where we camped last night. Their family (including their two kids) and friends are waiting for them at Sunrise and they will finish and renew their vows today. So sweet! Then, later we met a couple from the Midwest that knew the blog through an old high school classmate of mine. We talked for a bit and then I turned to catch up to Buck-30 to realize he was practically napping nearby. He said he wanted everyone to know his strategy for when I run into people and that he quite enjoys these extra breaks. A bonus break for Buck-30. 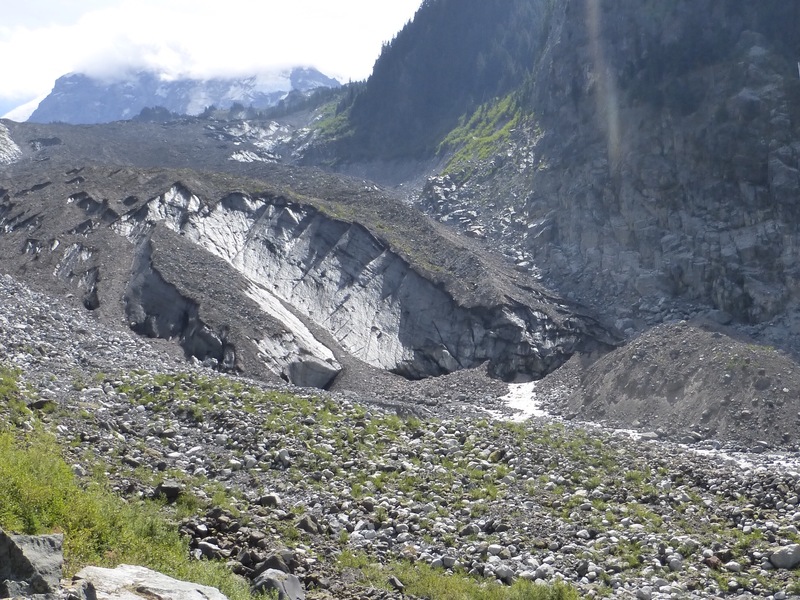 Carbon Glacier, our second glacier of the day. They are quite massive in person, but it is sad how much they are receding. Not as high as the last one, but they sure do freak me out! We ended the hike with the Spray Park alternate. It parallels the WT, just adds a few miles, and gives one more chance to get some great views up high. Many WTers choose to do it and I think it’s totally worth it. We both agreed that it was a nice way to end the hike. We ended at a campsite named Eagle’s Roost. 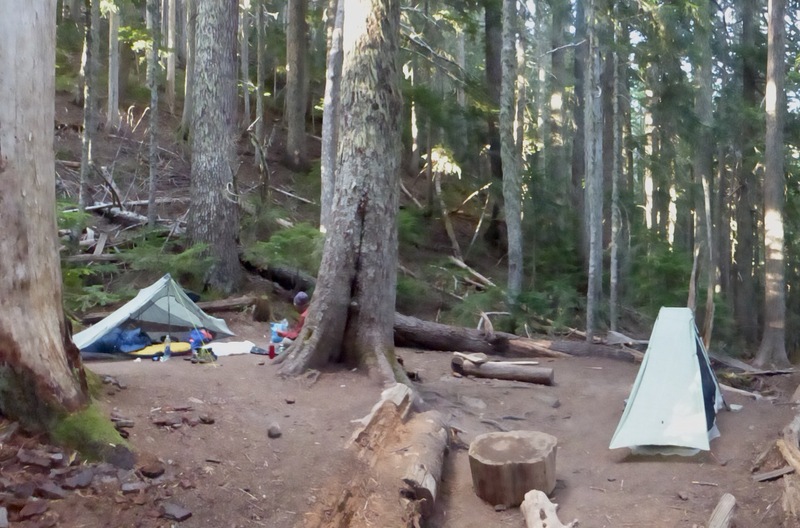 It is just 1.8mi from a trailhead where there is a mass car camping area. We could have hiked out tonight, but agreed that having one more night was the right thing to do. 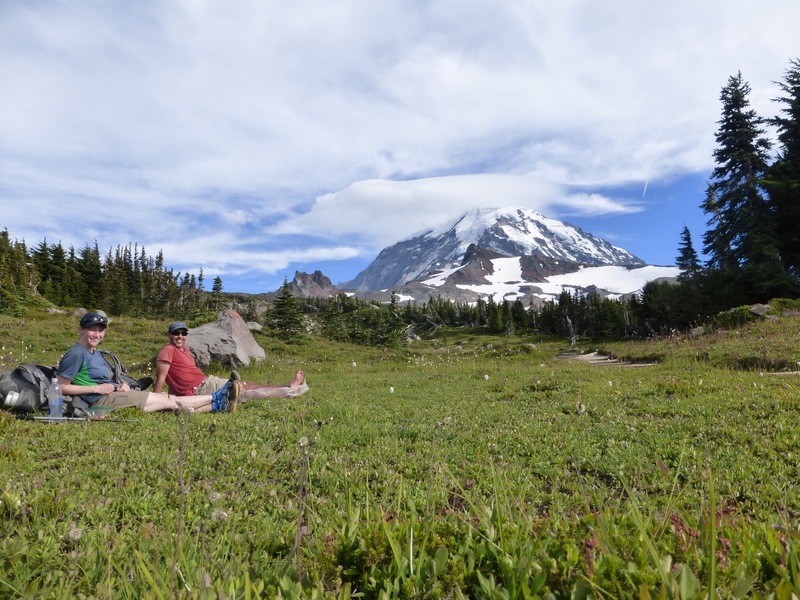 It’s a bit of a drive back to Portland, and there’s no reason to squeeze that in after a full day of hiking. We were shocked to get all seven campsites all to ourselves! 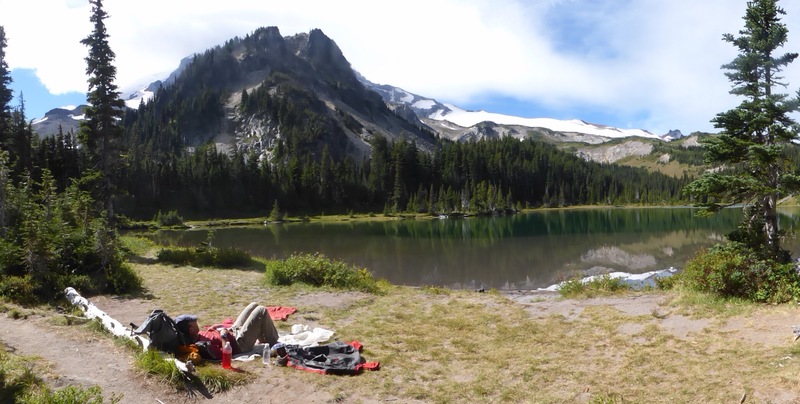 This is a really nice area at Spray Park and it’s so close to a trailhead. We couldn’t figure out why no one was here?? There’s even a slight view of Mt Rainier looming right through the trees that I couldn’t capture with the camera. We really enjoyed having it to ourselves and even got one last episode of UnReal in after dinner. As it was getting dark, three hikers came into camp. We had passed their packs earlier while they were sitting off trail at a water source, but didn’t see the hikers. 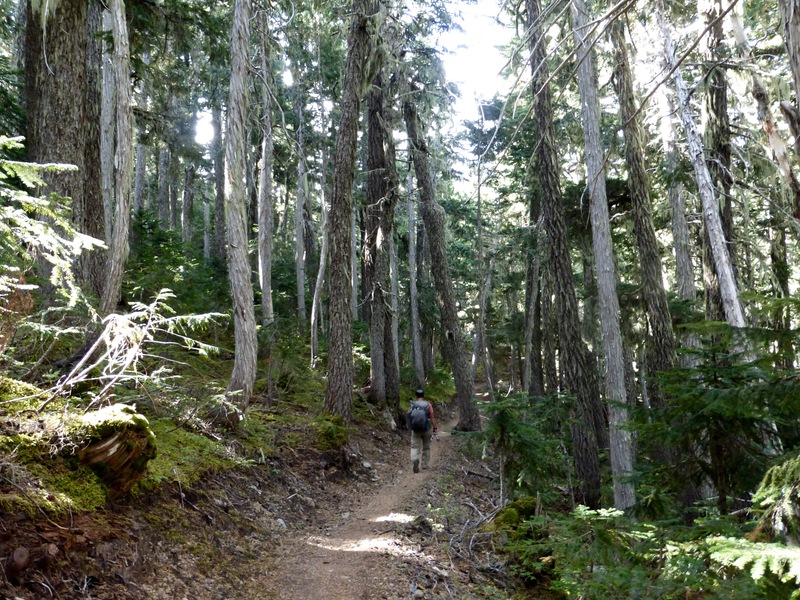 Just by looking at the packs, Buck-30 commented that they might be thru-hikers. We haven’t seen many of the lighter packs and one had a ULA Circuit and another one had one of the new Six Moon Designs packs. 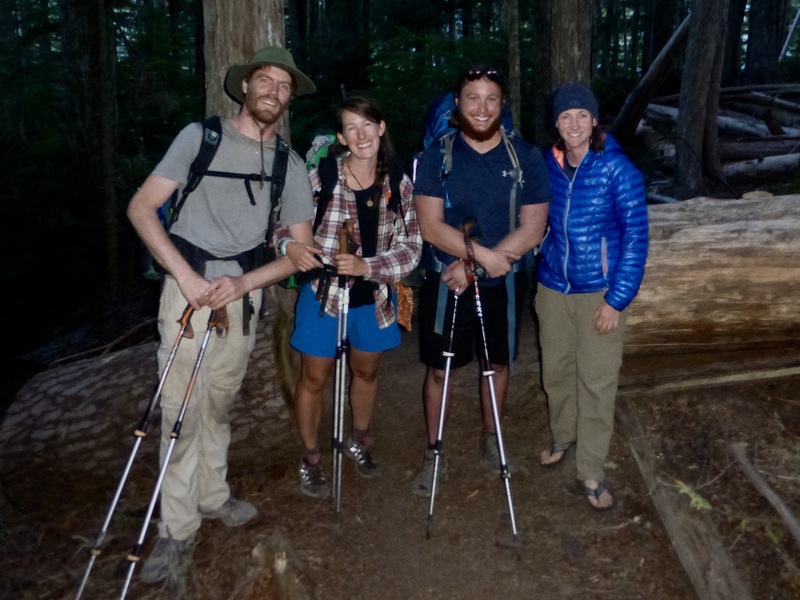 We got to talking to them and they were thru-hikers! In fact, all of them were 2014 ATers, the same year I did the AT! They were doing a reunion hike. 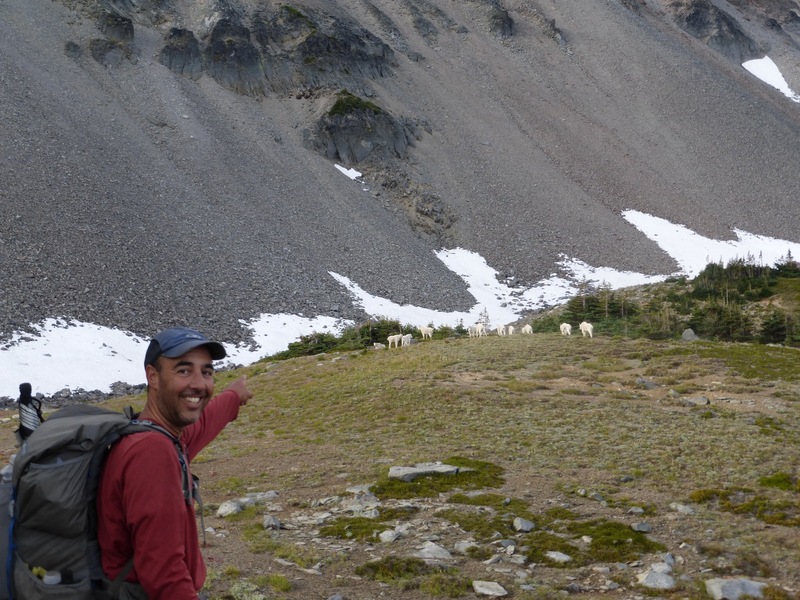 One of the hikers, Patches, remembered that we actually crossed paths on the CDT in Montana last year when E and I did a section hike before the GDT. He then recognized Buck-30 and remembered that the two of them shared a table with a large group of hikers in Northern Montana on the CDT as well. Small world. Yes, I do love this thru-hiking community. Appalachian Trail, class of 2014ers Patches, Caboose, Cuddles, and myself. Well, we have less than 2mi to hike out tomorrow morning, so I’m not going to post anything on that. It was great to get a chance to do a trail with Buck-30 and I wouldn’t be surprised if we don’t find some obscure trail to try together someday in the future. For now, I’ll have a 2wk gap in hiking before I head to Australia. I will be filling that time with plenty of planning and taking my annual end-of-summer Chicago visit to see my twin sister and nephews. I’ll do another more detailed post on the Australia and New Zealand plans before I leave. Buck-30 has plenty more short trails ahead still this year. Next up, Buck-30 will be doing the relatively new and more remote Bigfoot Trail in Northern California. Here is a link to Buck-30’s journal on that one, which is sure to be interesting as he tests his tolerance of poison oak… Thanks for coming along on another trail and I’ll be back in a couple weeks as we go international baby!!! Thanks for sharing another epic adventure. I’ve been peeking ahead to your upcoming walks down under and they look amazing! I can’t wait to hear about your experience on them. My wife and I will be seeing Rockin’ and Dan in Mammoth in a few weeks so we’ll say hello. In the meantime, enjoy Chi-Town (which is my hometown). Oh cool! I didn’t realize you were from Chicago Rambler. AUS and NZ may not be as grand as some of the other hikes I’ve done, but I’m really looking forward to getting out on some extended stuff solo with a fairly relaxed plan to just go with the flow. I went to NZ and AUS when I was 14 and I can’t wait to see the hiking highlights. Awesome Wired! Oh man, I bet it has changed quite a bit. I’ve heard it’s just become super touristy and I kinda wish I’d done it before the crowds. Please check and double check all your equipment—before—getting on the plane for Australia. Haha, I know! I may be just using my own gear list to literally check it all off! Hi Wired, I love your blog of the WT. Three years back a couple of friends and I had planned the whole itinerary and even gotten our permits. It’s a trail I wanted to do since I hiked the PCT in ’76. As it happened in the months before the hike my back went south. I missed that opportunity. 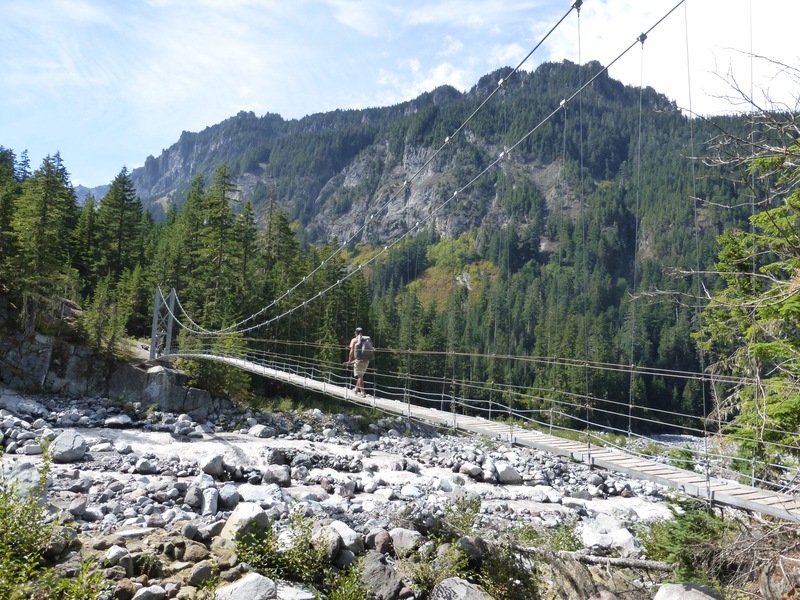 However, the next year Cynthia Stockwell who did the Pacific crest Trail with me and I spent two weeks in the North Cascades revisiting our favorite sections of the PCT. 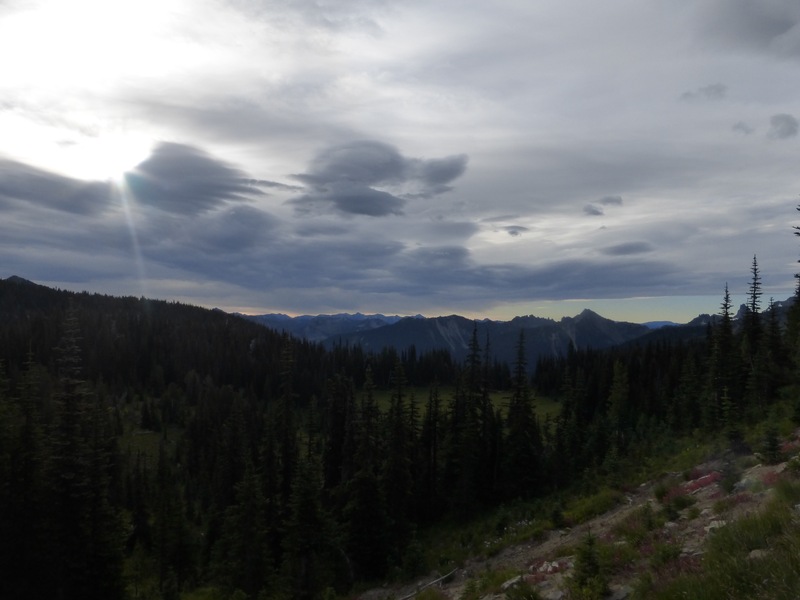 The most beautiful section was that around Mount Rainier. We car camped on the east side of the park, hiked trails and took wonderful photographs of the vistas and the flowers that were at full bloom. This place is a world treasure. Anyway, your blog is a mighty fine representation of doing the trail myself. Thanks. 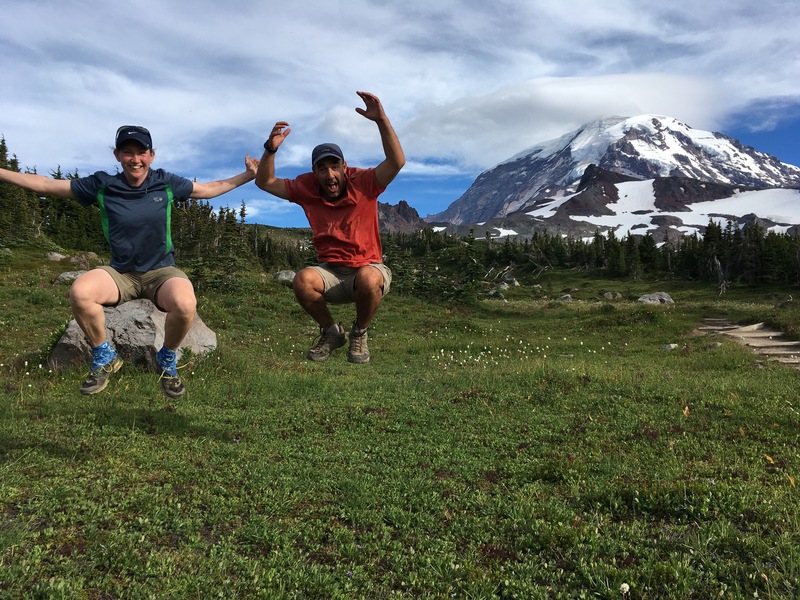 Yes, that east and north side are the place to be around Rainier! You are so welcome Jean. 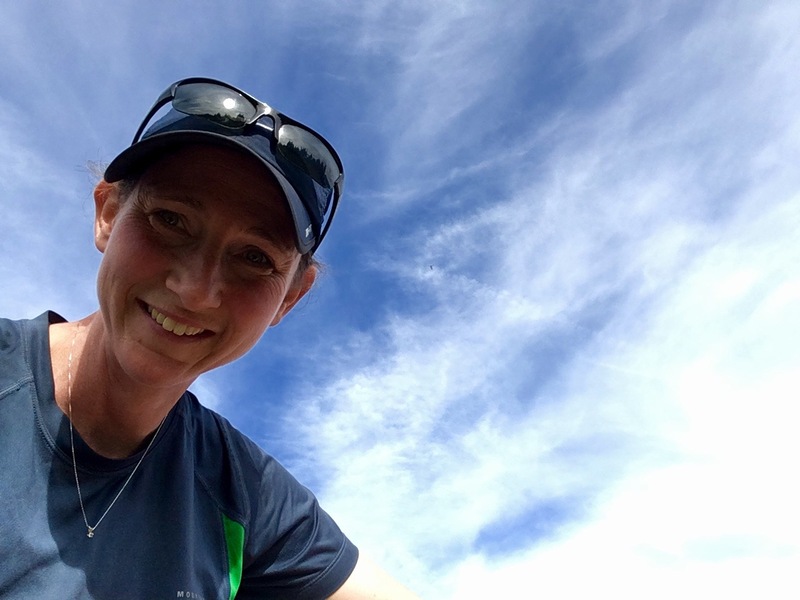 These trails (not routes) are where I feel like the blog best shines and I’m looking forward to more entertaining days and posts on the trails in AUS & NZ! That finish photo is pretty cool. Congrats on yet another trail finish. Thanks for sharing your fun blog posts! The WT was on my list before, but even more so after seeing your great photos! I’m bummed that you won’t be at The Gathering this year. I hope our paths cross next year. Until then, happy trails down under! Thanks Jill:) I think the Gathering will be a really fun one this year and I am bummed to be missing out. Yes, go and enjoy the WT, but know it’s quite wooded on the west and south side. Nice woods, but wooded. 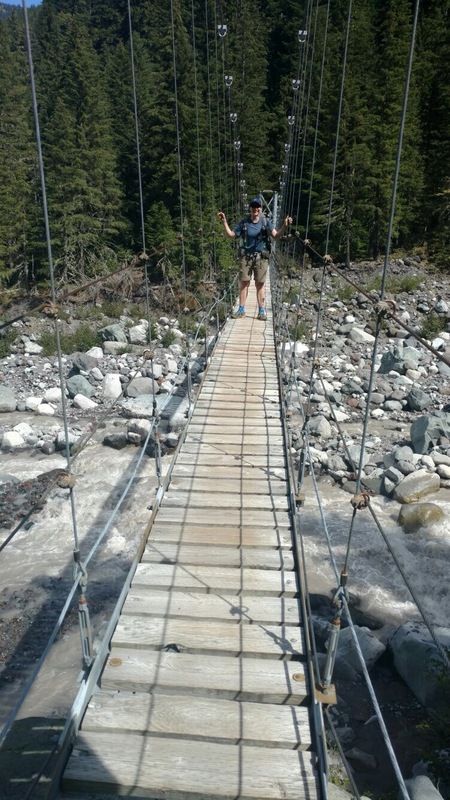 The Wonderland Trail is interesting but perhaps a tad crowded for me I think. 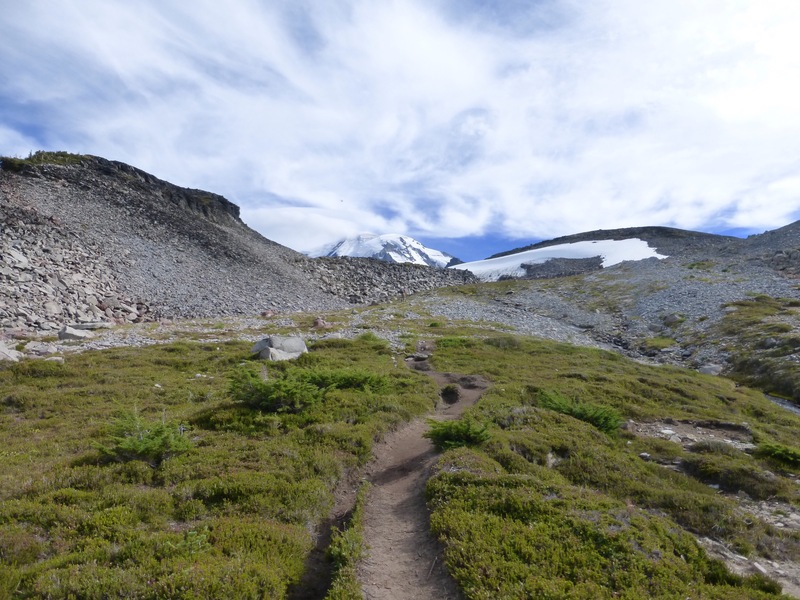 I read that Rainier is an active and potentially dangerous volcano; but Wiki says it last erupted in 1854, so I guess you didn’t take a huge risk going there! Greatly looking forward to New Zealand, Erin… just remember, you can’t go back for anything! Write a checklist, and use it.. Yes, I really have to double check everything! WT seems like the perfect hike to relax and enjoy, after the amazing strenuous summer’s hiking we have enjoyed with you. Your photo ‘ What a perfect day!’ says it all. Really looking forward to seeing you ‘down under’. Safe travel. Oh cool. Yes, when I moved out west after being in Illinois the first 30yrs of my life, it was like a completely different world! Australia is going to be much like desert, which I don’t know if people are expecting. NZ will be all over the place! Another fun hike under your belt and such an enjoyable one for all of us that follow your Blog. Great pictures. Have a great 2 week break and then back to an exciting adventure for you and us!! Wahoo! I look forward to these upcoming ones being more entertaining for blog readers as well. Back on trail and around more people, which makes for more interesting reading for sure. Oh cool! Nice to meet you. I won’t be headed through Melbourne at this point. Hope your kids are able to make it out. Ok, I just had to look that up and got quite a photo. I may never see a koala the same again, ha! I thought you’d find that one amusing. Scientific name ‘Earthus Gravitus’. In a former life teaching Outdoor education we used to hand out a scientific ‘fact sheet’ to each hiking group before their first overnight hike, much fun for all!! 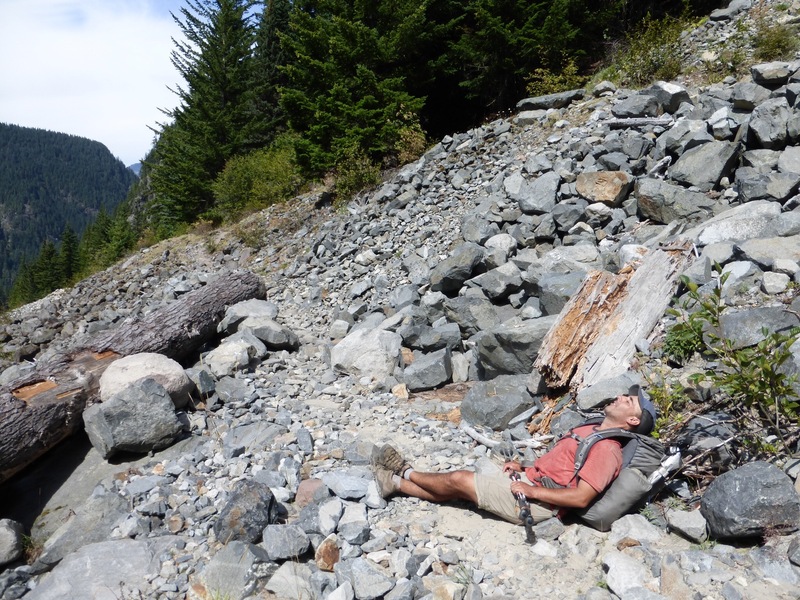 But seriously, I find your analysis of the super lightweight hiking gear very useful. keep it up. Have enjoyed reading your post – could you possibly share what camera you are using? Your photos are beautiful! Yes, I have it listed on my gear list tab. It is the Lumix DMC ZS25. It is an older version and I didn’t like the newer version as much, but all the Lumix cameras are great! Ha, have to correct you there, according to the Australian Museum its scientific name is “Thylarctos plummetus.” It has its own Wikipedia entry.. Erin should watch out for bunyips and yowies too, apparently! oops.. that was a reply to Graeme about Drop Bears, see above! Good ones! Looked them up too. Now I’m ready for anyone that tries to trick me! 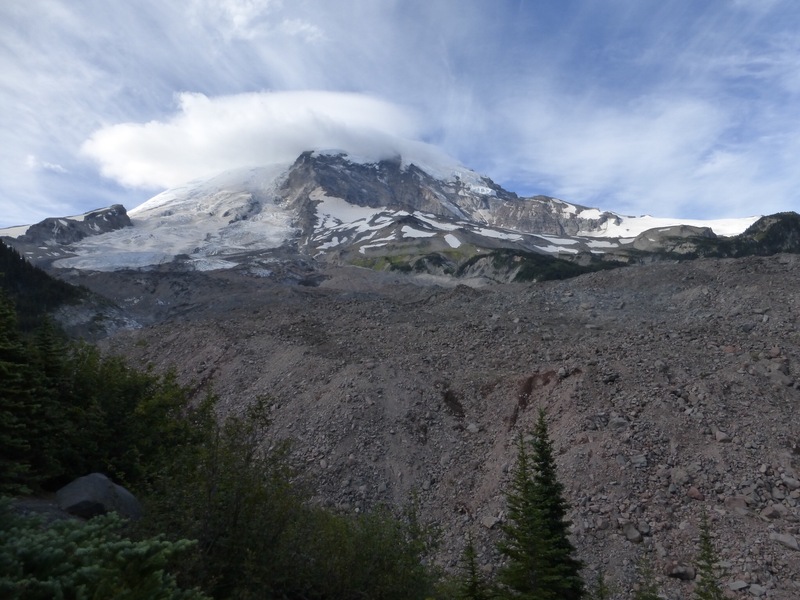 I love the cloud cap on Rainier, and Carbon Glacier is so beautiful!